Plan your expenses and investments without letting an unexpected situation derail your financial strategy. Let MoneyTap’s personal loan for salaried employees take care of the expenses that you didn’t plan for. Financial stability is often a major challenge faced by salaried individuals. If an unplanned expense arises, the financial discipline that they maintain goes haywire. Living paycheck to paycheck is not that rare for a lot of people and there are times when you might need additional financial help or backing when those monthly payments creep up around the 25th or so of each month. Most people will have some sort of payments that cycle again and again like credit card payments, EMIs, car payments, home instalments, investments, etc., and when it is time to make these payments, there’s a good chance that you’re low of cash. This is when MoneyTap’s personal line of credit can be a blessing. Although salary credit happens on a fixed day of the month, unexpected expenses come uninvited. Certain expenses like a medical emergency or your child’s admission fees cannot be delayed. Bill payments like your phone bill, electricity bill, DTH recharge usually have their payment dates at the end of the month, the time of the month when you are left with little or no cash in your account. In such situations, you cannot wait for the salary credit to bail you out. A simple cash loan from MoneyTap's personal line of credit can help. Additionally, there are some other unplanned expenditures that could also spring up like, urgent travel, a close relative’s wedding, medical emergencies, child’s educational needs, etc. To meet these unplanned expenditures, MoneyTap provides unsecured personal loans for salaried people, thus giving you access to a personal line of credit, which you can use as and when required. You can get your personal loan approved without any collateral or guarantee. You can borrow a small personal loan, as low as ₹ 3,000 from your approved personal credit line that could be as much as ₹ 5 Lakh. You have to pay interest only on the amount you use. You have flexible repayment option depending on your repayment capacity. As a salaried individual, it is quite normal to keep aside some of the money to invest in SIPs, mutual funds, etc., which is, in fact, a good financial decision for salaried people as mutual funds are known to deliver good returns when held for a long term. But, when a short-term money need arises, is it wise to break your investment or apply for a personal loan? This is where MoneyTap can help. Better is to go for a personal loan and let your investments grow. It is always better to hold some amount of liquid cash for a rainy day like a job loss situation. For short-term financial crunch, you can use a part of this corpus, but if your requirement is larger it is recommended that you go for a personal loan rather than use all your corpus. With MoneyTap's line of credit of up to ₹ 5 Lakh, you can take a personal loan for salaried people without having to disturb your cash balance. MoneyTap is a tech-enabled consumer lending platform, where you just have to fill in an application form, upload a few documents and get your personal loan approved. It is a hassle-free process with wide credit eligibility criteria. Salaried people with take-home monthly income as low as ₹ 20,000 can apply. Am I eligible for a personal loan for salaried employee? If you are a salaried employee, your personal loan amount will depend upon your income, the company you work for, and your ability to repay the loan. What is the tenure of a personal loan for salaried individuals? The tenure can extend from anything between 12 to 72 months depending on the bank you choose. However, MoneyTap’s loan tenure is 2 months – 36 months. How soon can I get a personal loan for salaried employee? The minimum monthly income required to get a personal loan for salaried individuals varies from bank to bank because each bank has their own eligibility criteria. 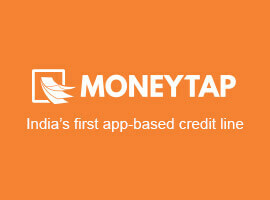 With MoneyTap, you can apply for a personal loan if you have a minimum take-home salary of ₹ 20,000. What are the minimum and maximum loan amounts for salaried personal loans? The minimum and maximum loan amounts depend upon your salary, the organization you work for, and the number of years of service you have put in the organization. Be ready for cash-strapped situations in between paychecks. Get MoneyTap's line of credit.